Two books of this multi-volume Qur'an, of which pages 100 and 101 of book II are shown here, are the only ones kept in the Rabat National Library. 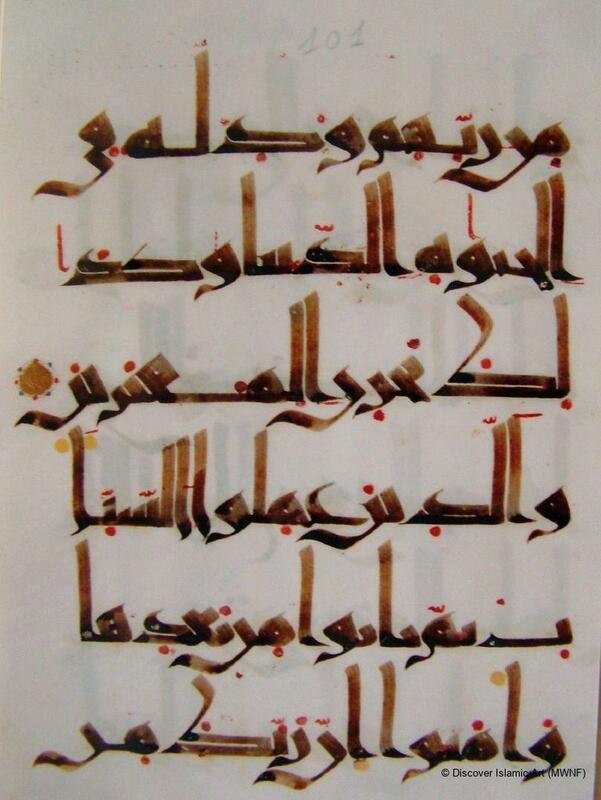 On almost square pages, they are both in Maghrebi kufic script in brown ink on parchment. Although in the same style, the calligraphy in the two volumes is not the same, suggesting the work of two copyists. However, judging from the thickness of the lines, the roundness in the angles of the letters and the depth of the curves, the two styles belong to the same period and to the same Qur'an. Kufic script in the West started to differ from the oriental style in the second half of the AH 3rd / AD 9th century, evolving towards a style known as Maghrebi, which reached maturity two centuries later. 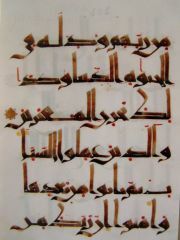 This type of writing, which continued to obey Abu al-Aswad's archaic system of vocalisation, has no diacritical marks. Only the short vowels are represented (fatha, the letter A ; damma, the letter O, red dots over the line), kasra (the letter I, red dot under the line), and shedda (indicating the duplication of the letter) which today is written like a lower case w. The yellow and green round dots denote the vocal attack. 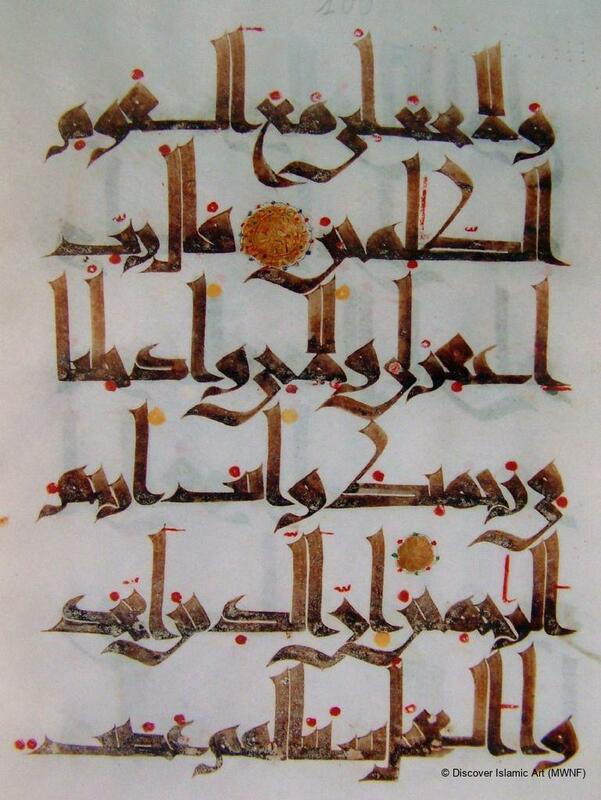 In this Qur'an, the titles of the suras lack any specific decoration. Only small golden rosettes framed by little dots, alternately blue and red, mark the separation between the verses, whereas the big rosettes, delicately adorned, embellish the verses in groups of ten. The written forms found in this specimen could link it to Zirid Qur'ans. Some very regular small punched holes in the upper margin of every page, where the word habus appears, prove that this book was brought as a pious offering to a shrine, probably in Fez. This Qur'an transcribed on parchment was offered as a pious gift to a shrine. 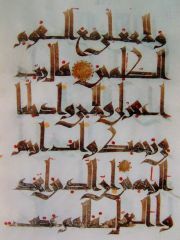 The square format and the archaic kufic script with its rounded angles are characteristic of the Maghrebi calligraphy of the period. The red dots and golden rosettes mark the vowels and the separation of the verses. Format and stylistic analysis of the script: archaic kufic style, codified for the system of vocalisation devised by Abu al-Aswad ad Du'ali (68 / 688) and adopted in the Muslim world from the 2nd–3rd / 8th–9th centuries. The calligraphy in these two volumes of the Qur'an is similar to the Western variant, known as Maghrebi. This Qur'an is thought to be from Fez, as the town was the Idrisid capital and home of the Qarawiyyin university. Allouche, I. S. and al-Rajrari, A., Fahras al-makhtoutat al-arabiya al mahfouda fi'al khisana ai-amma bi Ribat al-Fath (inventory of Arabic manuscripts kept at the General Library of Rabat), 2 volumes (1921–53), Paris, 1958. Al-Rassy, J. et Varichon A., De l'empire romain aux villes impériales: 6000 ans d'art au Maroc (catalogue), Paris, 1990. Benjelloun-Laroui, L., Les bibliothèques du Maroc, Paris, 1990. Dandel, E., Maroc: les trésors du royaume, catalogue, Paris, 1990. Andalusian Morocco: A Discovery in Living Art, pp.108–9. Ifriqiya: Thirteen Centuries of Art and Architecture in Tunisia, pp.182–3. Archéologue et historienne de l'art, titulaire d'une licence en lettres (française), N. Elkhatib-Boujibar a également étudié l'archéologie et l'histoire de l'art à l'Institut d'art et d'archéologie de Paris, l'art islamique et la muséologie à l'École du Louvre (Paris), et suivi des cours à l'Institut d'ethnographie de l'Université de Neuchâtel (Suisse). Elle a occupé plusieurs postes de responsabilité, parmi lesquels directrice des Musées et de l'Archéologie, inspectrice générale des Musées et de l'Archéologie, déléguée régionale du ministère de la Culture. Elle a dirigé un chantier de fouille durant 20 ans et enseigné à l'Institut national marocain des sciences de l'archéologie et du patrimoine (INSAP). Elle a organisé différentes expositions sur le patrimoine marocain, au Maroc comme à l'étranger, et animé des cycles de conférence, dont celui sur l'art islamique à la “Villa des Arts” à Casablanca. N. El Khatib-Boujibar a publié différents articles sur le patrimoine archéologique, artistique et architectural marocain, mais aussi sur d'autres sites islamiques et sur les arts mobiliers. Elle a également participé à la rédaction du catalogue Musée Sans Frontières Le Maroc andalou, à la rencontre d'un art de vivre.